What could be better than a mid-summer’s walk around beautiful Lake Nokomis? How about that walk, plus a few appetizers, a lovely beverage and a few new contacts in your health care marketing and communications network? Join us for an evening stroll along the lakeshore. We’ll meet at Sandcastle then set off on an easy walking tour as the sun sets over the lake. We’ll stretch our legs, talk some shop, get to know each other and broaden our professional network. This event is open to MHSCN members and non-members! We’ll make introductions and new connections during our group walk. Then we’ll circle back to our original starting line at Sandcastle for more conversation, delicious appetizers and a thirst-quenching drink of your choice! We’ll have tables reserved and delicious appetizers including nachos, cheese curds and shrimp and octopus ceviche. One drink is also included! 6 to 6:15 p.m. We meet. 6:45 p.m. to whenever Return to Sandcastle tables for a fun group networking download. 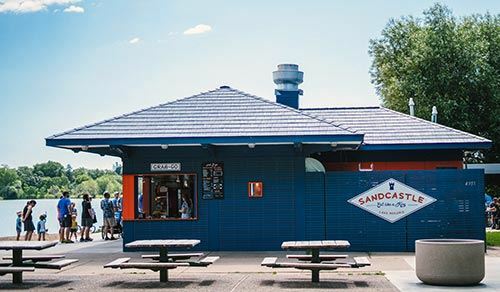 Enjoy food, drink and relaxation by the Lake Nokomis Beach!